Goal Crusher Tank. I am hearing people are sizing up in this. Goal Crusher Jacket. This is cute but I don't need it. New Pace Rival Crops in Harbor Blue and Harbor Paint Storm Print. The Transcend Tank is tempting. Pedal to the Medal SS. I do like this material for running. I'll have to check this out in the store. I was hoping the US would get the Pavement Pusher bra. Nothing for me today. Did you order anything? The Transcend tank is amazing, got it 2 weeks ago in 2 colours. It's a little thin for the price but it fits perfectly, is a great length and has a nice higher neckline and details. I have no interest in the mesh - which is good! I'm hoping the hero pace rivals end up on WMTM this week. Wish they would come out with more neutral solid colors. Maybe this fall. Nothing for me again this week. The Goal Crusher Jacket looks nice but I don't need another one that thin. I was hoping for a lightweight lined one but I guess that isin't going to happen this summer. As they did in the spring they are only offering it in black, white and orange and that is why I didn't buy the Slightly Gathered Jacket earlier this year. For the first week in a long time, I don't have any fomo. Good thing with SeaWheeze coming up! 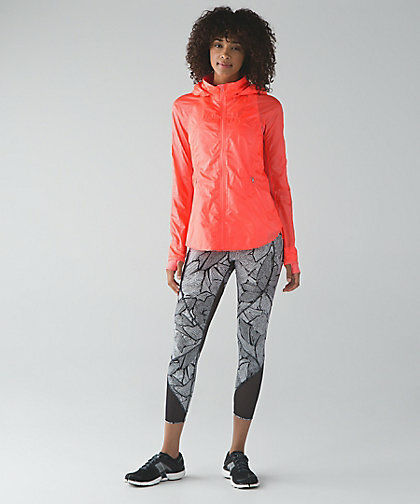 The Goal Crusher jacket is cute, but it's too close in color to my Gather me Lightly to jump at it. 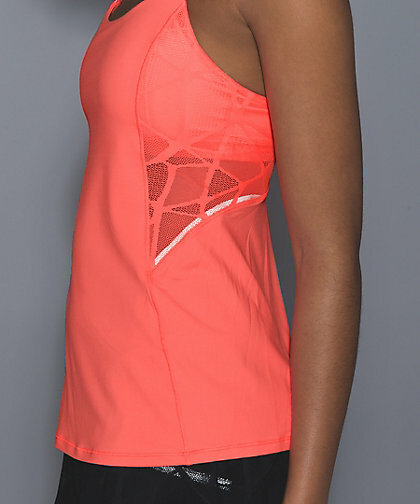 The goal crusher tank looks like a crb with a mesh back, and it's $58. Maybe it's just me, but the pricing lately has been turning me off. Most of the new bras are almost $60. Crops for $98. And the wmtm prices are going up too. Speeds and swiftly short sleeves used to be 39 on mark down - and now they're 44. They're not giant price hikes - but I've always felt like lulu purchases were splurges already. :-/ definitely nothing tempting me tonight. 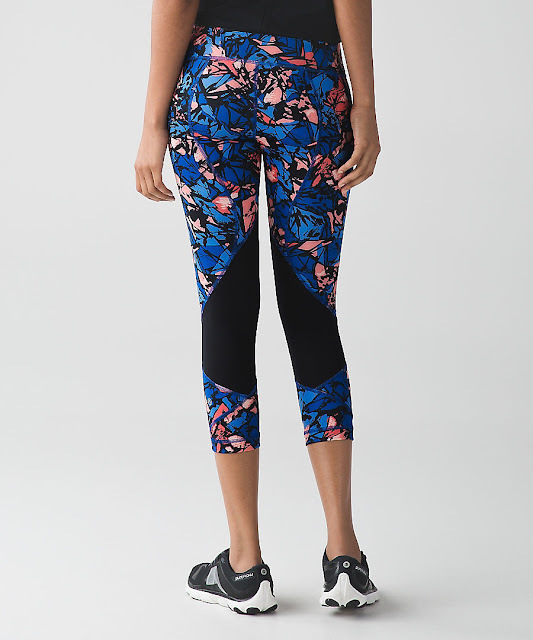 I went into the store today and tried the Goal Crusher 7/8 tights but didn't like the mesh on the inside of the legs. I ended up ordering the crops and the Take Ten shorts since they weren't in my store! The cool cocoa WUC are cute and I'm tempted, but I'd rather they be WUP and released in a season I would wear them...like Fall or Winter. I can't see myself rocking cocoa crops in 95 degree heat. Nada, I am done with all the mesh/pantyhose looking stuff. Almost went for the Take 10 pants but do I really need another pair of $100 sweatpants??? I've been hoping for the Dottie Tribe to show up in the Run Times Shorts. I don't love the new print on those. I am curious about the Sun Runner crops. I sometimes have issues with the Full-on Luxtreme being too loose in the knees (in order to fit my waist/hips). But I love the Paint Storm print. And I cannot justify paying an extra $40 for the Tight Stuff crops, especially because I don't like the lack of good pockets. Sigh. I have a gift card to spend and I'm just not motivated by anything. I ordered the Wee Space Cool Cocoa WUCs. A couple of uploads ago I purchased the Zen Bender LS in Cool Cocoa and I really like the color - it's a nice neutral taupe color and will (hopefully) look great with these crops! @ anon 6:07 pm - it does but if you were going to get a tarted up CRB then I'd say get the Lace one. 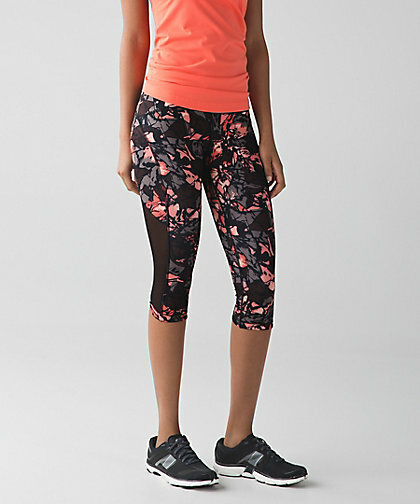 The material is super lightweight and breathable and, unlike luxtreme, it won't ride up and it's only $48. 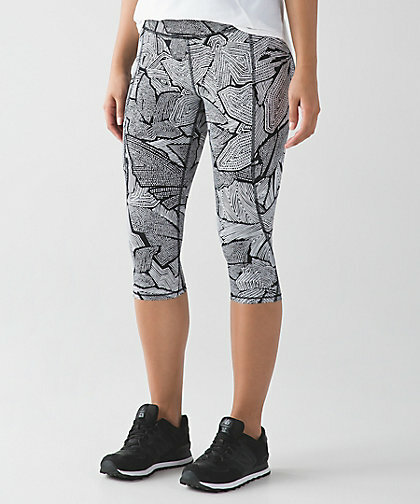 I thought the Rise and Flow tank is a deal at $54 - lots of detail, nice thick luxtreme and and adjustable bra. I love the goal crusher jacket and picked it up in store yesterday. This is my first LLL jacket and I'm pumped to use it camping! I like the Cocoa WUC but also wish they were WUP instead. Anon 4:13pm You and I are in sync about the pretty prism print. I am in Canada and was waiting for that print in the Slightly Gathered Jacket but all we got was the black, white and flashlight. No offence to people who like orange but I can't wear orange and I don't want a black or white summer jacket. I was lucky however to get Run Times Shorts in the pretty prism on sale in store. It is such a great print and the I have lots of tops that looks good with them, my best buy of the summer so far! I am happy for the orange lovers out there but I can't wait for it to be over. Nothing for me either. 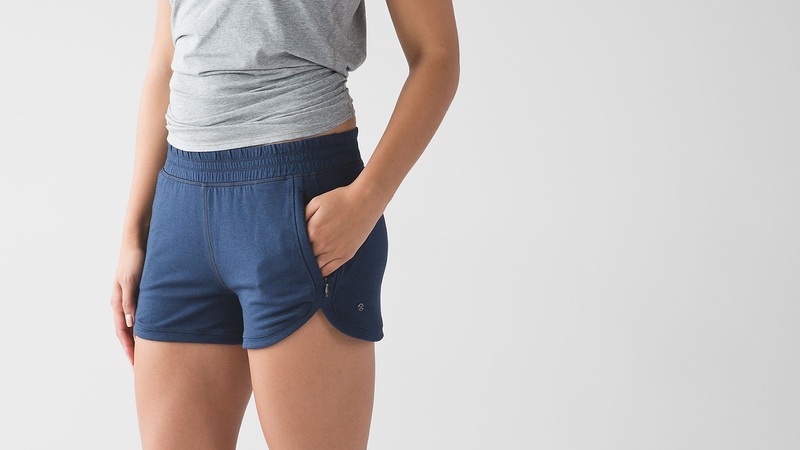 I need to see some try-on pics of the Run City shorts or try them on at the store myself. Anyone who has the lace CRB, did you order your own size or sized up? A bit off topic, but does anyone know what pants the model is wearing with the white goal crusher jacket? I MUST have those! I'll definitely be picking up the clear mint Energy bra that was uploaded as I am obsessed with that colour right now! I do wish they would bring back the Power Purple that it was paired with in 2014. I loved those colour schemes. I'm also intrigued by the Harbour Blue Pace Rivals but I find they can be hit or miss on the colours. I LOVE my Tofino Teal ones, but when I tried on the Hero Blue they just didn't work. 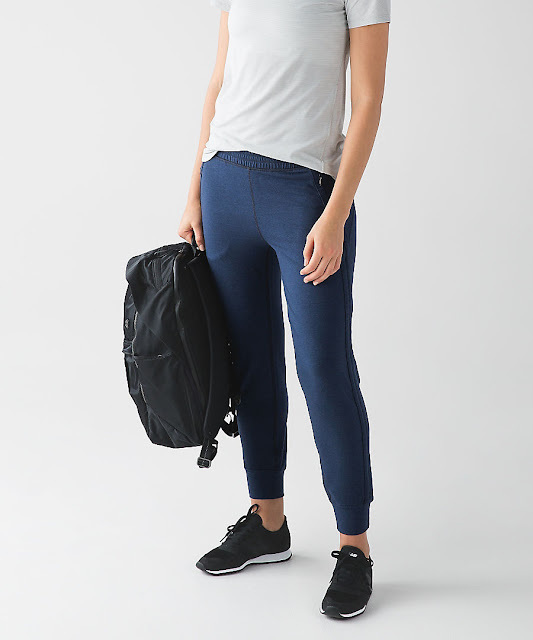 I'm desperately hoping those Cool Cocoa WUC's come to Canada, I LOVE the colour and those buttery soft crops have become my go-to for squat days at the gym. I got the Harbour Blue Pace Rivals. Apparently I can't resist blue pants. I got nothing. I don't look at the website too much, I just come to your blog to get all the juicy news. @ anon 8:20 am - Power Purple showed up in the Ivivva line recently so maybe it will come back to us, too. @M & anon 12:28 pm - lol & thanks! At Anon 5:57. I bought my CRB size in the new Lace CRB. The reviews saying to size up are from a different Lace CRB. Someone at Lulu got lazy and recycled. Just know this is a more singlet fitting tank and not supposed to fit against your skin like the Luon CRB's. @LLA - Do I spy the What'sup hat in the first pic? Oh I hope so, and I hope they go back to velcro instead of the cheap plastic hole adjuster!